First stag 2012. Forestry red deer hunting. Shop UA Hunt – They won’t hear you. They won’t see you. They won’t smell you. 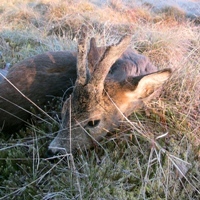 I have not had much luck on our syndicate’s ground this roebuck season. It is usually like that in April and as the forestry is on the hill it is much colder and all is delayed in comparison to lowland. For many of us joining a deer stalking syndicate is the only way to get into stalking in this country. I have done my fair share of paid stalking and I still do if I only have some spare cash.